U.S. Energy Secretary Rick Perry said the nation has a “moral obligation” to build Yucca Mountain in Nye County. Erik Verduzco/Las Vegas Review-Journal Energy Secretary-designate, former Texas Gov. Rick Perry, testifies at his confirmation hearing before the Senate Energy and Natural Resources Committee on Capitol Hill in Washington D.C. in January. Photo provided by Nevada Governor's Office Nevada Gov. Brian Sandoval speaks with U.S. Energy Secretary Rick Perry in Washington D.C. earlier this year. Sandoval has urged the federal government to find an alternative permanent storage site for nuclear wastes. On Tuesday, Perry said that the U.S. has "a moral obligation" to build Yucca Mountain in Nye County. 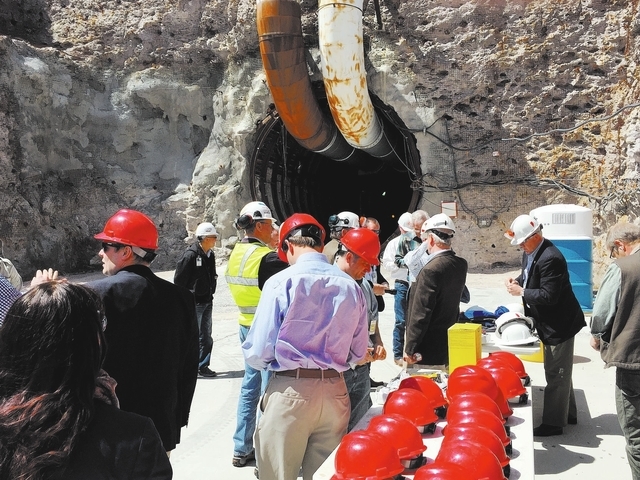 Special to the Pahrump Valley Times A group of government officials and reporters gather outside the entrance to Yucca Mountain for an informational tour in April 2015. U.S. The Trump administration is seeking $120 million for the Department of Energy to restart the licensing proceeding of Yucca Mountain. 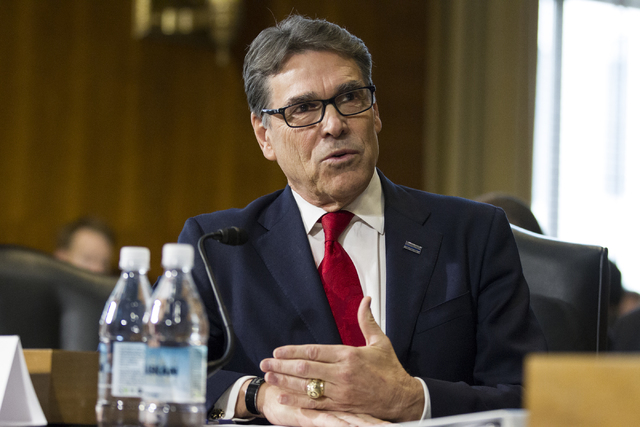 Perry appeared in front of the House Appropriations Energy and Water Subcommittee on Tuesday, when members of Congress discussed the fiscal year 2018 budget request for the Department of Energy. The Trump administration is seeking $120 million in the 2018 fiscal year for the Energy Department to restart the licensing proceeding for the stalled Yucca Mountain, an idea that is widely opposed by most Nevada officials. The subcommittee’s chairman, U.S. Rep. Mike Simpson, R-Idaho, said the Obama administration made “the costly and wrong decision” to abandon the Yucca Mountain licensing application. Approximately 120 sites in 39 states hold spent nuclear fuel and high-level radioactive waste. Nevada is not one of them. In response to Simpson’s question, Perry described his plans to move forward with Yucca Mountain. Perry said it’s important for Congress to be a part of the solution because, “It’s your citizens that have the most to lose if we continue to leave this waste in your districts,” he told Simpson. Perry also mentioned his late-March visit to Yucca Mountain. “The first trip I took as a secretary, was to come to Nevada to see that facility, to talk to the men and women that have been working on it for in some cases decades, and recognize that it is the proper place for long-term storage for us to do our duty, to follow the law, to put a plan into place,” he said. During his testimony, Perry also suggested using the Nevada National Security Site as an interim storage location for high-level nuclear waste, a statement that quickly drew scorn from Nevada officials. Perry said he believes interim storage should be done as officials are working toward “standing Yucca Mountain back up,” getting it operational and following the law. “I think it’s so important to have the discussion with the members of Congress, so that they can share with their constituents why this is so important that we move as much of this waste, whether it’s transuranic waste or high-level waste out of their districts either in the interim or in the case of the Yucca Mountain permanent storage site,” Perry said. The Las Vegas Review-Journal on Wednesday reported that after Perry’s comments about an interim storage created a firestorm, he said that no decisions have been made on temporary sites for spent fuel storage in Texas, New Mexico or Nevada. “I think it is appropriate to say, there are no plans at this particular time for interim storage in New Mexico, Nevada or Texas or any other site,” Perry told a Senate subcommittee on Wednesday. Sandoval also said that he asked Nevada Attorney General Adam Laxalt to review the “misguided proposal” and identify legal avenues to stop it. “Until then, I am prepared to do whatever I can to stop ill-conceived proposals from advancing,” Cortez Masto said. 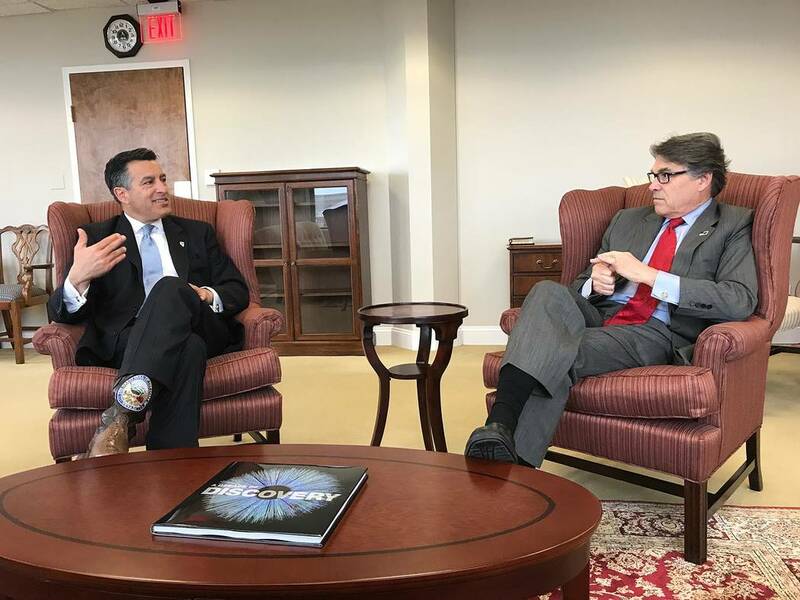 Perry’s comments, however, drew a different reaction from proponents of the project, particularly in Nye County, where officials support the restart of the Yucca Mountain licensing proceeding. Nevada State Sen. Pete Goicoechea, R-Eureka, said previously that he would like to see part of the former Nevada Test Site used as an interim storage site for nuclear waste. Meanwhile, the Nuclear Waste Policy Amendments Act of 2017, proposed by U.S. Rep. John Shimkus, R-Illinois, the main proponent of Yucca Mountain in Congress, seeks to eliminate the prohibition of an interim storage facility in the state of Nevada from the Nuclear Waste Policy Act. Shimkus’ draft legislature came out as a result of multiple hearings held last year on the matter of nuclear waste that has been piling up at nuclear reactors across the country. The measure has been widely regarded by Nevada officials as an attempt to bring Yucca Mountain back to life. Shimkus’ spokesman Jordan Haverly said the bill would allow for an interim storage facility to be constructed in Nevada. The U.S. House of Representatives Energy and Commerce Committee’s environment subcommittee held a hearing on the bill in April. Haverly said the next steps for the bill are introduction and a full committee mark-up.